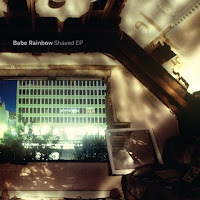 Canada's Babe Rainbow makes a bold debut entrance on Warp with the apocalyptic mine-steppin' sound of the 'Shaved EP'. It would appear that the reverberations of dubstep have reached the shores of British Columbia as a muffled clang, rusted with industrial detritus and encrypted with ritualistic tribal percussion. The first shock of Cameron Reed aka Babe Rainbow's sound comes on the sludgy 'Popcommon' sounding like the Substance remix of Monolake's 'Alaska' mixed with Russell Haswell in warm-up mode. 'Screwby' follows, circulating tribal steppers rhythms around marshy subs and banshee screaming atmospherics and 'Combed' lulls us with music box melodies and ghostly string sashays, something like the Caretaker doing a dubstep waltz with Zoviet*France. With 'Care' we're strongly reminded of Shackleton's overcast temperament and rhythmic contours while the final title track evokes images of Scorn-like doom-dub dystopia. Really Strong 12"!!! !